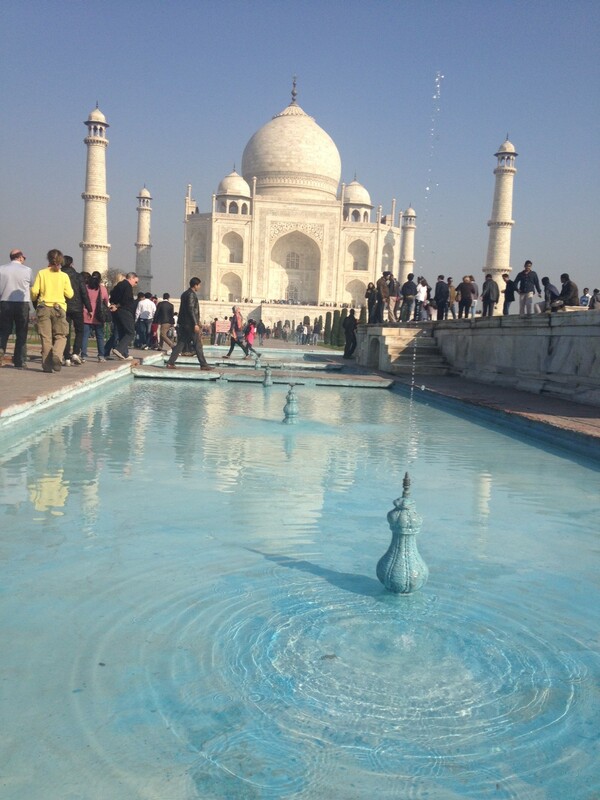 India’s First Wonder – Agra Day 3. An early morning start (so what else is new!) Again, Agiet, our driver, is waiting – now he has a big smile for us when we see him. 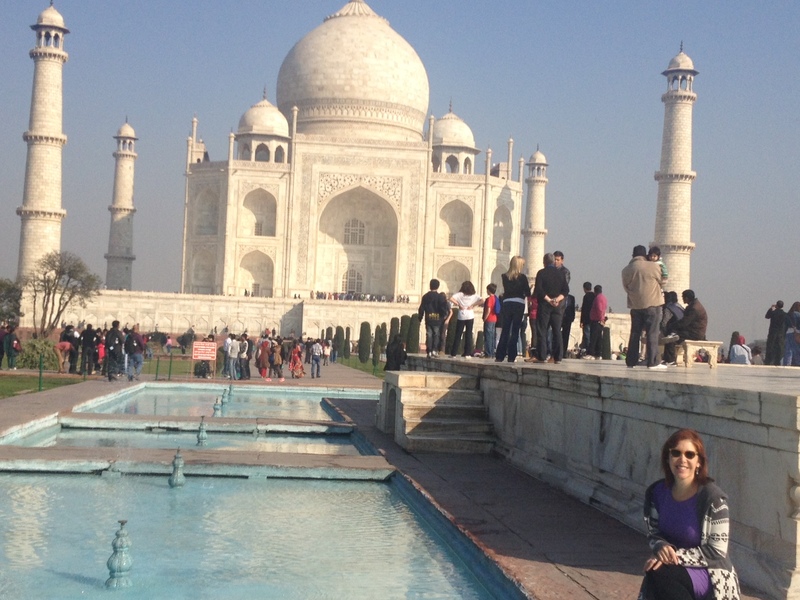 Off for a daylight look-see at the Taj Mahal – the top of many people’s bucket list, and often referred to as one of India’s 7 Wonders. We are hoping and wondering if we can bring our camera during the day. We still couldn’t figured out what the big iPhone threat from the moonlight tour was and why we couldn’t bring them. But today is a new day and we are hopeful. 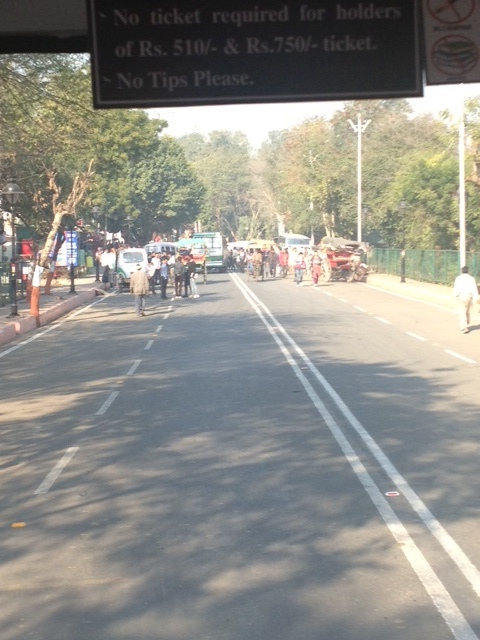 We get to the Taj Mahal, load the electric bus and make our way through a sunny cheerful street filled with tourists and touts selling every kind of Taj Mahal trinket. 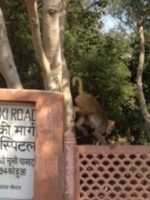 They do a quick scan of our purses and a body frisk, are skillfully lead to the females only entrance and again we’re in the entry courtyard of the Taj. What a stark contrast to the gloomy, security driven, armed soldier experience from the evening before! Our guide, Naval, walked at a brisk pace, but we wanted to finally shoot some pictures (we were very relieved to be able to take the iPhones in to the site in the daytime), but he said not to, but wait and walk some more for a better shot. We listened – assuming he knew what he was doing, -then 50 steps later he abruptly stopped, insisted we hand him both our phones, pointed to where we should stand and took our picture. I felt a mix of gratefulness – since he obviously knew where the best shots were, but a bit annoyed for not being allowed to find my own shots. 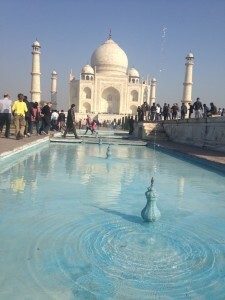 But, India has shown me that I have to let it move me, rather than for me to move it. So, move I did. Our guide’s walking style was fast but he would suddenly stop, tell us where to pose or shoot and off we’d go to the next photo op. 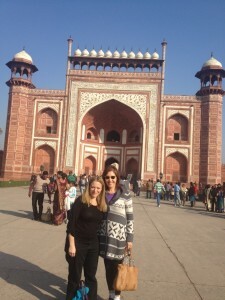 After our first photo he talked about where we were standing – the entrance arch. No Taj Mahal in site, but instead an enormous red arch with Koran Verses (I believe there are 17 in total throughout the complex) imbedded into the archway with semi-precious stones. The actual size of the letters is smaller on the bottom and they get larger toward the top. 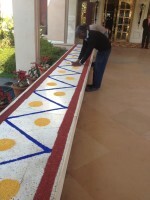 This creates the illusion that the Sanskrit is the same size top-to-bottom when viewing it from a short distance. Brilliant, is what I thought. 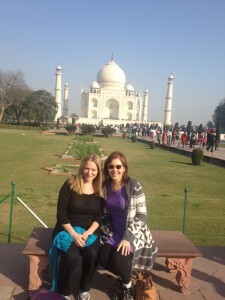 We walked at a brisk pace through the entryway of the Taj Mahal…. and now for the moment I had been waiting for. There, surrounded by the haze of the city’s constant air pollution was a gorgeous, gleaming monument to a man’s great love. A tombstone built by Mughal emperor Shat Johan for his third wife Mumtaz Majal after she died giving birth to their 14th child. Shat Johan, was off on a hunt at this time, but on her deathbed, his soul-mate requested that he never remarry and he have no more children. Like a good man, he complied. 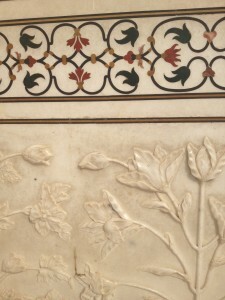 He is buried next to the love of his life inside the Taj, but she (as in his life) is the center of the symmetrical site and his body lays off-kilter by her side. Next a stop at a bench for another photo op , then one with us kneeling beside the fountain. I laughed when I got home because with all the expertise and bravado, Naval wasn’t really much of a photographer. See me in the corner of this shot where he told me to kneel down! Of course, I guess I’m not supposed to be the most important thing in the photograph! 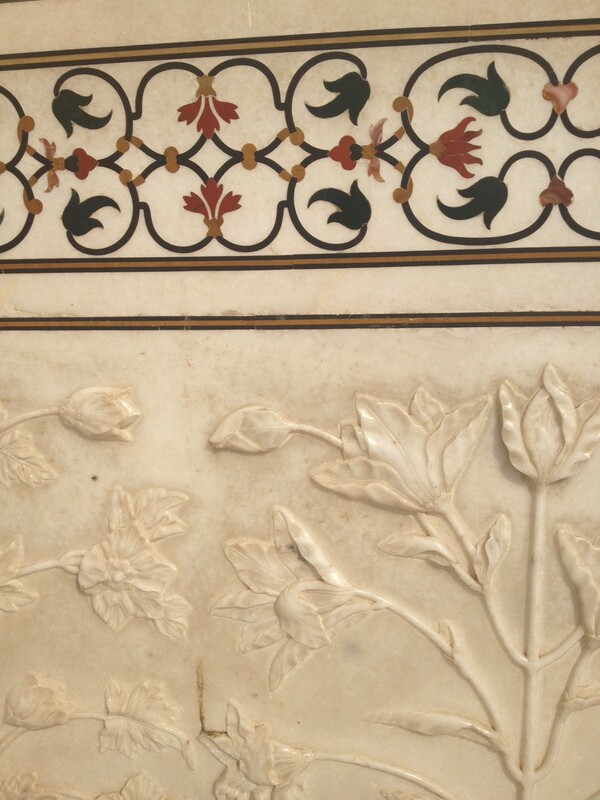 Throughout the Taj there are all sorts of semiprecious stones and carvings. The workmanship is amazing , and it is hard not to be in awe of the beauty of the immense structure and the loving delicate details. 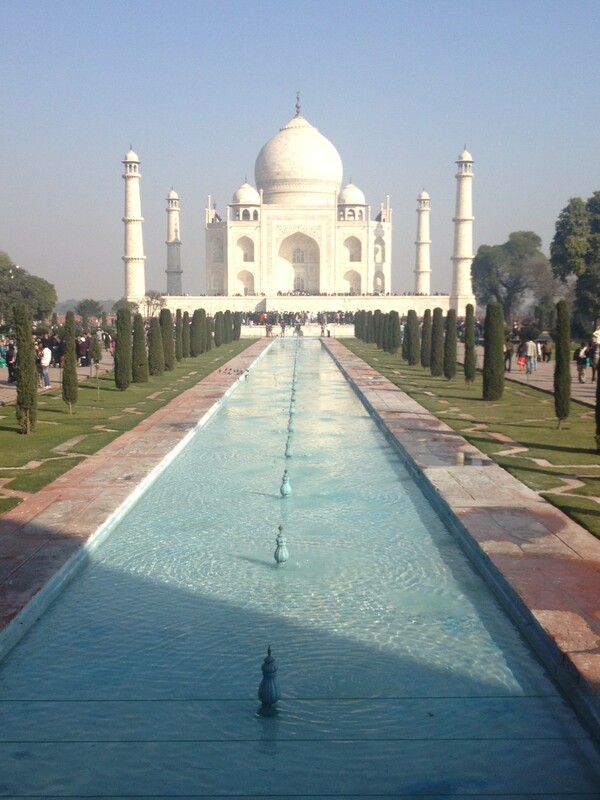 The Taj took 20 years to build, and people from the town and region dedicated their time and efforts to build it for their very beloved princess. 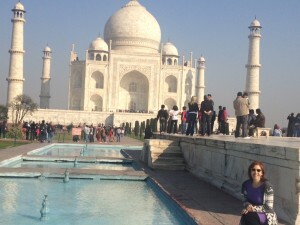 The guide’s description reminded me of Princess Di – the People’s Princess. We left feeling completely satisfied by the experience. I trip well worth it and a true appreciation for true love. Next, we wanted to buy some souvenirs. When Naval suggested we go shop for marble (like we’re going to carry that home!) I knew the words to live by were “Buyer beware!” The deal in many countries (if you don’t know it yet) is the person brings you to a high priced tourist store and then gets a cut of the purchases. 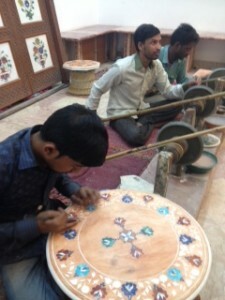 This place used the same techniques used to do inlay at the Taj Mahal. We were shown the workers cutting and shaping stone and heard they were descendants of the artisans who helped create the Taj. Truth? Who knows, but good story to tell the folks at home when you show them your hunk of inlaid marble you paid too much for. I was not that interested in an overpriced, but beautiful inlaid marble cutting board – but Lauri fell in love with one and couldn’t resist. Feeling pressure to buy, I gave in to a set of paper mache coasters. I’m guessing when we get home, neither of us will worry about overspending for our lovely souvenir. We headed back to the hotel to collect our bags and bid adieu to our guide, Naval. Agra: Site, Sound, and Visual Stimulation Abound. India Fertility Tourism: Where are all the cows??? ?